From beautiful ceremony and reception spaces to hotel rooms for out-of-town guests, you can find whatever you need to make your wedding day in Northwest Indiana special. Running along the southern tip of Lake Michigan, Northwest Indiana is one of the most diverse and versatile regions near Chicago. Whether you are opting for a beach wedding, an elegant ballroom reception or an event in a more country/rural setting, the South Shore of Lake Michigan is the perfect backdrop. Find the perfect romantic setting for your wedding ceremony and reception along the South Shore. Keep it classic at a traditional venue, host the perfect rustic reception indoors or out, or impress your guests with something elegant and sophisticated. There are also many locations in the region to host showers of almost any size. The beautiful beaches along Lake Michigan will provide stunning photos and a calm and peaceful backdrop as you say your vows. 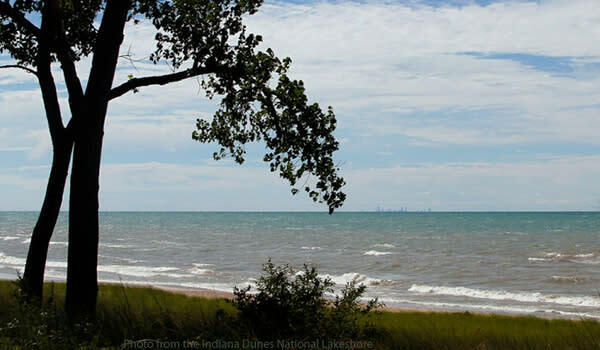 The Indiana Dunes National Park, Washington Park and Marquette Park all offer locations along the beach to hold wedding ceremonies. Looking for a delicious cake, gorgeous bouquets, and a photographer that will capture those special moments? We have suggestions for all the details for your wedding day. The South Shore Convention and Visitors Authority can help secure a suitable hotel for out-of-town guests. We can also provide your wedding guests with visitor guides to keep them informed of things to do and events going on while they are in the area. For more information on setting up a hotel room block or requesting visitor guides for your guests, contact Heather Becerra at 219-554-2224.